During the Lunar New Year, my friend Evie who is based in Norway, brought me a lot of Norwegian chocolate. Anyone who been to Norway knows the must-buy souvenir is Freia chocolate. I rarely like milk chocolate but the ones Freia are sick good. My favourite is Walters Mandler. 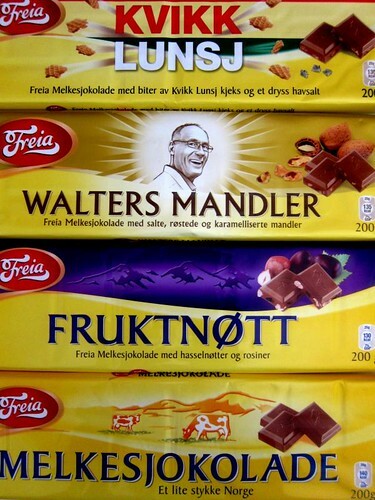 Freia’s Walters Mandler is made up of milk chocolate and salted almonds. While you are chewing on the milk chocolate, you get the sudden hit of salt and the crunch from the nuts. This combination is lethally good. And this got me thinking if I could translate this into a cookie. The answer is yes and it is dead simple to do. All you need is your favourite chocolate chip cookies (CCC) recipe and some sea salt flake. My current favourite CCC recipe is from David Lebovitz. The recipeis simple and the best part is you don’t have to bake everything. 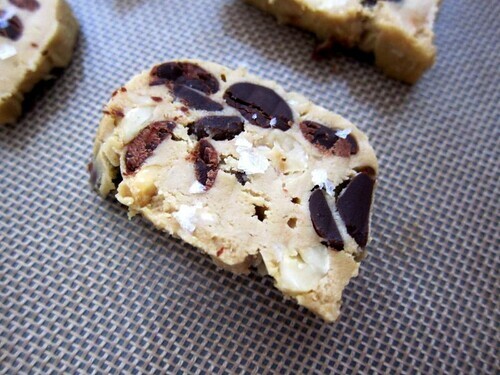 You can keep some of the dough in the freezer and use it as and when the craving strikes. I would like to thank David Lebovitz for answering my message on recipe sharing. I caught him at a bad time (he was (or is) moving house and I am grateful that he took the time to reply my message. Thanks David! 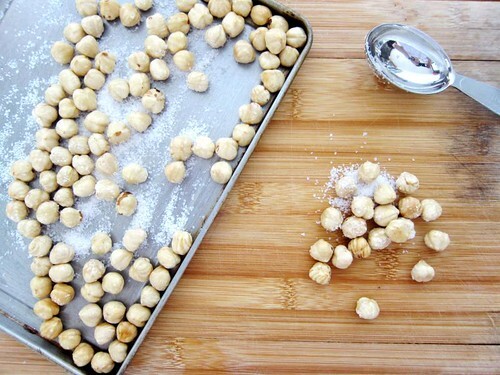 - In a bowl, mix together the flour, salt and baking soda. - Using a stand (or hand mixer) with the paddle attachment, cream the butter, brown sugar and vanilla together at medium speed until smooth. - Add in the eggs one at a time until thoroughly incorporated, then stir in the flour mixture, nuts and chocolate. - Once mixed, cover and keep the dough in fridge for at least 2 hours. 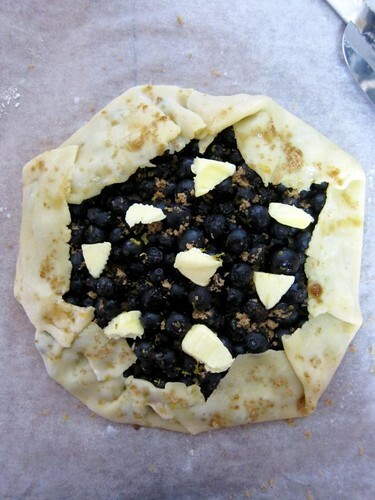 - Divide the dough into the quarters. Line the work surface or a chopping board with cling wrap, and shape each quarter into a log about 23cm long and wrap it in cling wrap. Repeat the same for the remaining dough. Refrigerate until firm, preferably for 24 hours. I like to keep my dough in the freezer and use what I need. - Preheat the oven to 175oC and line 2 baking sheets with parchment paper or silicon baking mats. - Slice the logs into discs of 2cm thick and place them 8cm apart on the prepared baking sheets. If the nuts or chips or dough crumbled out, push them back in. Sprinkle a tiny pinch of fleur de sel or Maldon sea salt on top of the disc (I have not try putting (kosher) salt on top as I assumed it will just dissolve once baked). - Bake and rotate the baking sheet midway until the cookies are very lightly brown in the middle. This takes about 10 minutes. If you are using the dough directly from the freezer, you might need a longer baking time of 12-15 minutes**. - Let the cookies cool on the baking sheets until firm enough to handle, then use a spatula to transfer them to a wire rack. - The dough can be kept in the fridge for a week and in the freezer for a month. The baked cookies will keep well in an airtight container for up to 4 days. 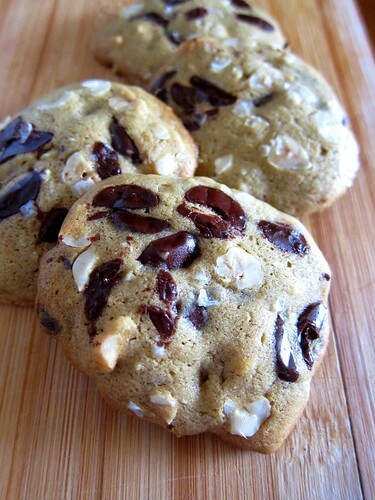 *To make the cookies saltier and stay true to the “Walters Mandler” style, you can use salted almonds. **The baking time really depends on how you like your cookies. I tend to like them under-baked and chewy. What I do is I will put in one cookie in the oven, bake it until instructed time, cooled, and taste and see if I like the texture. From there, you can adjust the baking time accordingly. I am a big fan of bills, Sydney, specifically Bill Granger. Last year, I got a copy of his cookbook, Bill’s Basics which gave a novice cook all the basic recipes. 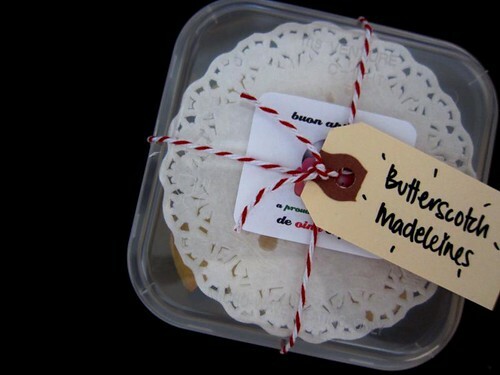 One of the recipes that I was drawn to was Butterscotch Madeleines*. I love madeleines – Dorie Greenspan got me hook onto them. However at times I don’t have the patience to let the batter sit overnight and Bill Granger version doesn’t require that. The ingredients and methods were simple and easy to follow. Like Granger, I do urge you to get a madeleines mould**. They are not too difficult to find. I got mine from Phoon Huat, and I heard you might be able to get it from Daiso. And really the bakes look so pretty. 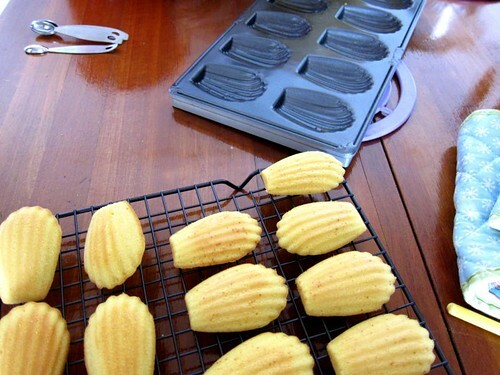 One of the keys to making Butterscotch Madeleines was to fill up the mould. 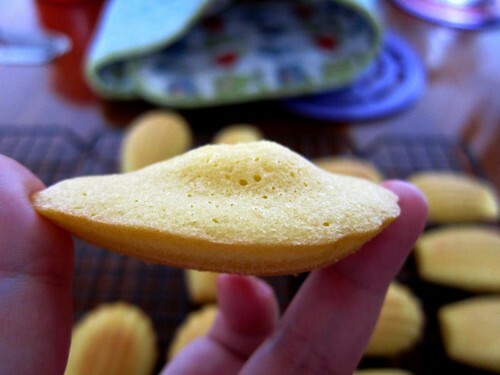 I under-filled the first round, and I did not get the hump which was the signature of madeleines. I am quite stunned how fast it took to make the madeleines – around 30 minutes, including bake time. If you need something sweet and buttery and fast, go make some madeleines. *For the caster sugar, I reduced it by half. For golden syrup, I preferred to use Lyle. 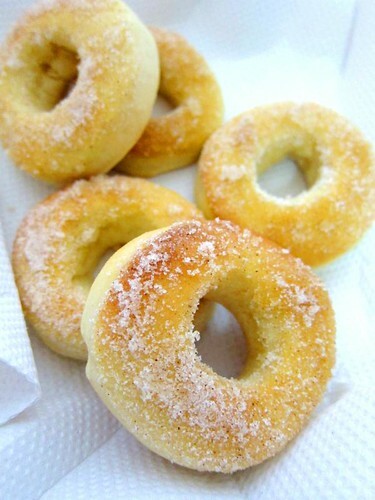 **At Phoon Huat, you can also get silicon madeleines mould. I got the small one and I don’t fancy it. The madeleines turned out pale which looked quite sad. I think metal or non-stick is still the way to go. 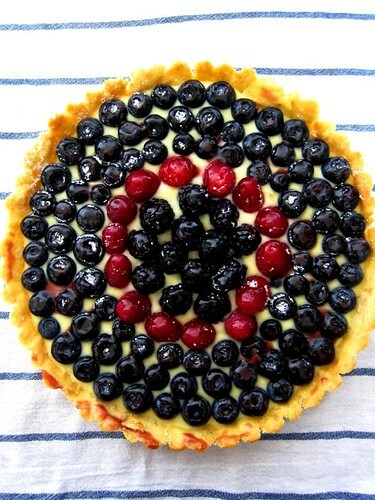 When you are given two punnets of blueberries, and you do not feel like making cakes, muffins or jam, you bake a pie. 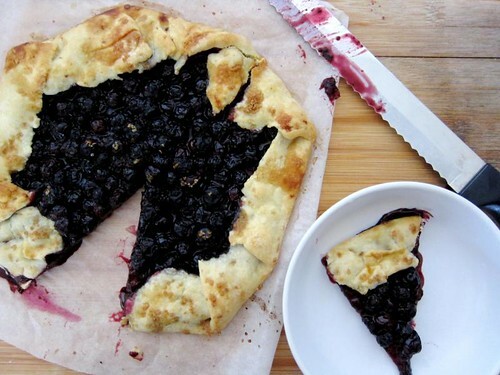 Actually a galette to be exact. 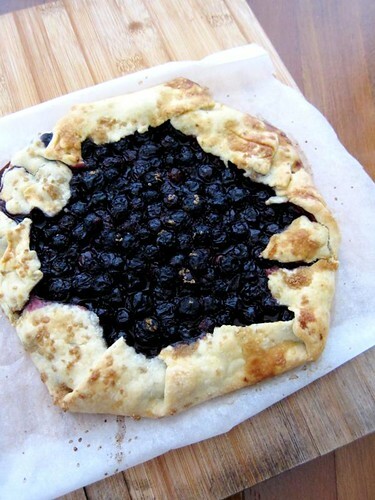 Similar to a pie, a galette is a freeform round flaky tart. However it is more rustic (this means even if you have zero pastry skill, you can still make it look good and taste delicious) and easier to handle (no fitting of the dough in a tart tin, no blind baking). To make a galette, you can use your favourite pie crust recipe (one pie crust will do). One of my personal favourites is from King Arthur Flour. However this time round, I decided to make a change and try out Delicious Day’s galette recipe*. The first thing I love about this recipe – it used all butter for fat. I shunned away from recipes that suggest the use of margarines (are you kidding me?) or shortening (they are absolutely disgusting). Nothing makes me happy than rubbing butter in flour – the smell of butter is heavenly. And I cannot resist a change. I swopped half of the all-purpose flour for pastry flour. The reasons why I did it were a) I have pastry flour at home and b) I want to get an even flakier pastry. The end result? The pastry was flaky and buttery. I think what makes a galette so awesome is the least amount of fuss, means reducing the possibility of overworking the dough and really you do not have to care so much about the shape. When I was rolling the dough, I didn’t get a proper round shape. When I fold it, everything worked out well. All you need to remember is to get the pastry as thin as possible (not paper thin of course). 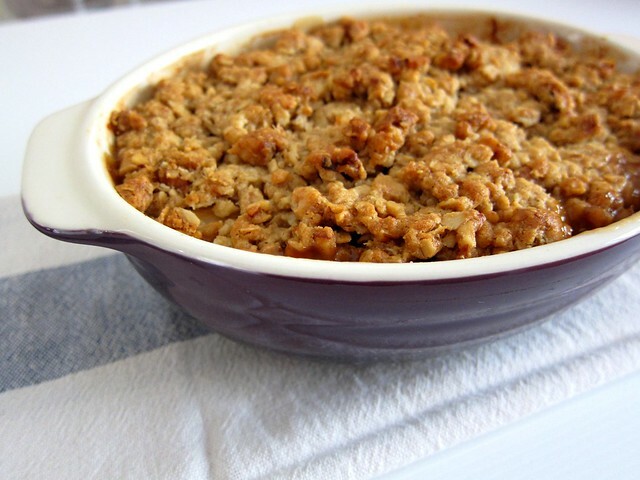 This is one quick and easy dessert to make for any occasions. *I used around 250g of blueberries – it will be okay to use around 300g. I did not use the whole full tablespoon of sugar as the berries were rather sweet. I would advise you to taste the fruit and decide the amount of sugar you want to sprinkle. Lastly, I wished I egg washed the pastry but as I did not want to waste an egg, I used milk instead – the result was not fantastic, only reasonable. As much as I like to make my sweet treats from scratch, ice cream is something I don’t make that often. Firstly, the sheer amount of egg yolks that go into the ice cream frightened me (cholesterol! ), and I don’t know what to do with the remaining egg whites (I don’t like meringue). And the custard mixture. If there is anything that can give me a heart attack, it will be custard mixture. 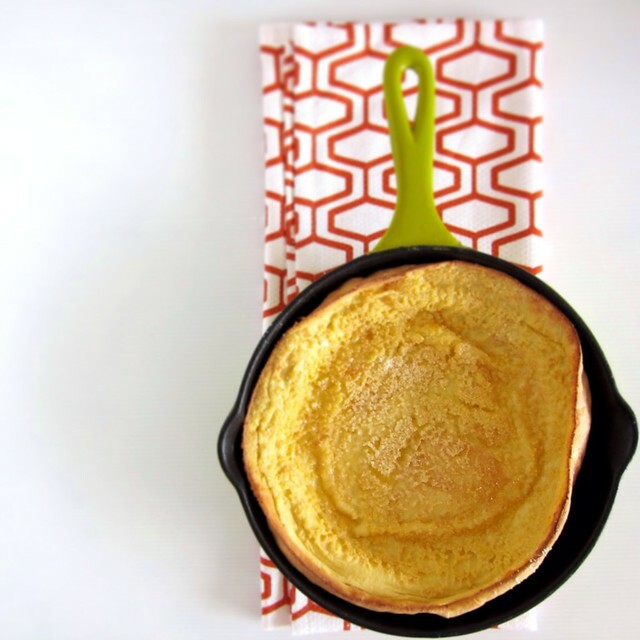 Boiling egg yolks and cream over the stovetop is not a fun matter – off the heat too early, the mixture is not exactly cooked and “sterile”; if we let the mixture boiled, the eggs might curdle. I was grateful when I came across David Lebovitz’s entry on Jeni’s Chocolate Ice Cream. At last, an ice cream recipe that does not require eggs and yet delicious. Of course, I immediately stormed off to Kinokuniya to see if I can get a copy. It took me two tries and I finally got a copy of Jeni’s Splendid Ice Creams at Home. There were a few recipes that caught my eyes. But the one that I was interested to make was the Buckeye State Ice Cream. 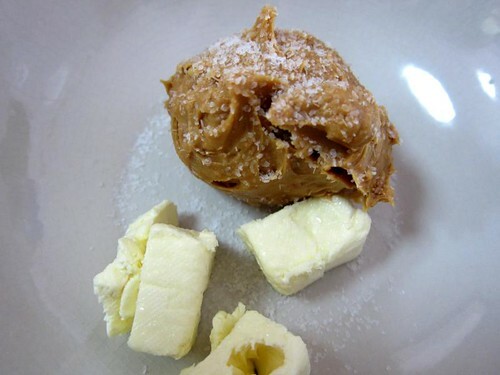 This ice cream mimicked the flavours of candy buckeye – peanut butter, honey and chocolate. Coincidentally, these are some of my favourite things to eat! I will never in a million years thought of putting cream cheese and cornstarch in an ice cream recipe, providing the taste and texture that we love about ice cream. 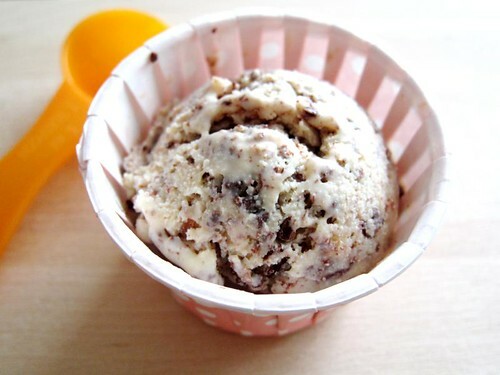 And the best thing about making this ice cream – I learnt something new – I now know how to make chocolate freckles. Because I don’t have an ice cream maker, when the mixture is really cold, I started swirling it (with one hand) and drizzled melted chocolate in it (with the other hand). Everything must be done fast as the chocolate solidified once it hit the cold ice cream mixture. I made this ice cream three times. Every time, someone had a bite into it – they screamed yummy-ness. Seriously who don’t love peanut butter and chocolate? If you watched Season 3 of Masterchef Australia, Billy Law is a name that you will be familiar. He is not just your ordinary food blogger; dude can write, cook, bake and take awesome pictures. 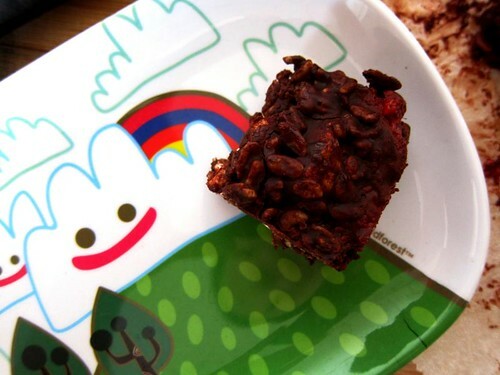 During his time in Masterchef, Billy whipped up this delicious looking Rocky Road for one of the challenges. And this dessert won him a “Best in Show” ribbon. 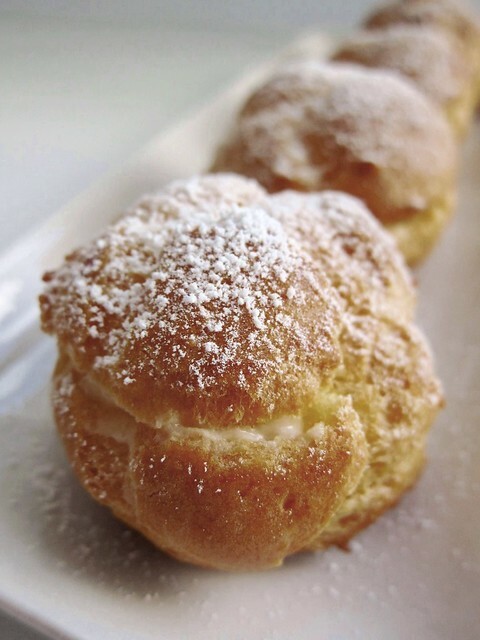 Billy recently put the recipe on his website and I got to try it – it’s so easy to make! 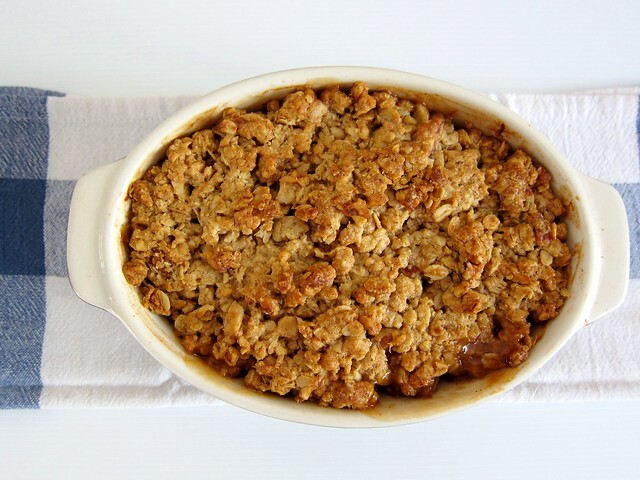 I love desserts that don’t require me to wash two big bowls, and a lot of prep bowls. And I did not even need to crank up the oven. 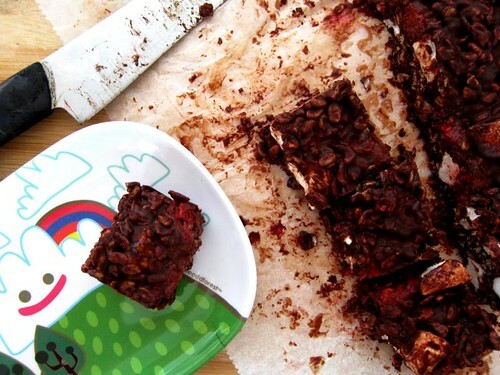 I also think this particular Rocky Road will be a fun dessert for the kids to make too – it’s just mixing the ingredients, and they can lick up the bowl afterwards, and get chocolate high. I love the richness of chocolate, and the tartness of the raspberries just cut through it. The addition of the raspberries was brilliant! I can definitely see this dessert making its way to my Christmas party.